The Digital Age is disrupting another industry … bigly. At the PortXL startup/tech event yesterday in Rotterdam, it was clear those rollicking ports of yore, full of salty seamen and sweating stevedores, are already history. In the place of noise, chaos and danger, data-driven ports of the future will have reduced carbon footprints with clean energy and sustainable construction; will be surprisingly quiet and orderly, considering you’re talking about giant container ships loading and unloading around the clock. And the changes are coming at light speed, judging by the technology we saw yesterday at Shakedown, PortXL‘s annual demo day/international tech event. Shakedown is the closing event for PortXL, Rotterdam’s maritime startup accelerator. Yes, the Port of Rotterdam has an accelerator focusing on technologies that will strengthen its position as Europe’s most important port, handling 30,000 on loads/offloads and a huge percentage of the world’s container-ship cargo. Spoiler alert: Dispatches covers a lot of startup events, but PortXL Shakedown stood out on quantity and quality of both the vendors and startups in the accelerator. Just the setting is worth the trip, with PortXL held at the RDM Complex on the Port of Rotterdam, with the main event in a humongous building where the Dutch navy once built submarines. Which was good, because we estimate more than 1,000 people passed through the event. Several surprises, including most of the startups and scale-up teams are international. We met entrepreneurs from the Netherlands, Israel, India, the United States and Canada. Another surprise was how many of the scale-ups and vendors on hand for the event had fully developed hardware, tech and applications ready for the market. It was a full day, and here are some of the highlights. At the closing ceremony for this third acceleration program, each startup’s success is measured by the number of contracts they sign, by the way. 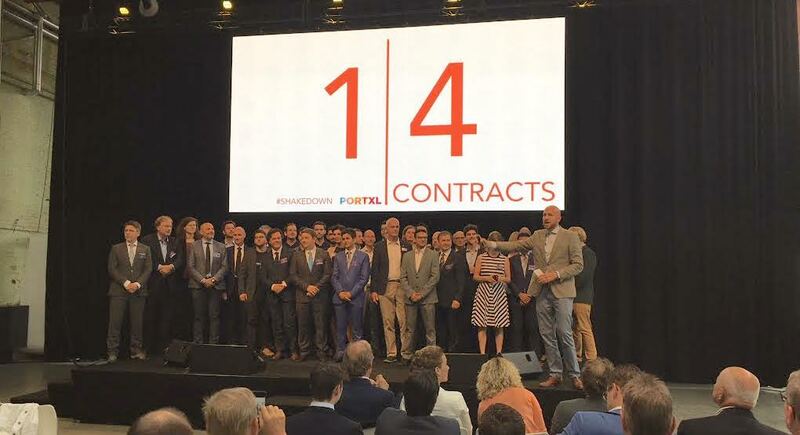 So the closing brings the teams on stage, and the total number of contracts was 14 for 14 startups. Pretty great …. If you’re wondering which topics are of interest to the port authority, they’re focusing on the sweet spot where shipping and commerce intersect: Digitized logistics, autonomous ships, sustainable construction, water treatment, blockchain, emissions reduction, cybersecurity and sustainable energy. • ECOncrete is one of the 14 accelerator grads. Israeli Shimrit Perkol-Finkel, who’s a Ph.D. in Zoology from Tel Aviv University, is CEO of the company, which has created sustainable concrete construction methods that improves life for both humans and marine life. The concrete, which has an outer coating to keep contaminants from leaching out, is rough so it provides an inviting surface for sea life such as oysters and clams. “Studies show oysters actually make the concrete 10 times stronger,” she said. Perkol-Finkel said she and her team already have installations on the East Coast of the United States, in the Red Sea and in the Mediterranean. We rated Perkol-Finkel’s pitch the most effective of the event. • Even in 2018, tugs still use tugs and ropes to guide the big container ships into the port of Rotterdam. India native Gary Vaz has developed “tow bots,” robotic thruster jets that can be attached to ship hulls. Vaz’s Tow-Botics Systems technology is distilled from his years as a master mariner and port-management executive. Vaz says this is just the beginning … that AI and autonomous tech will be implemented to make the process totally automated. Tow-Botics has a 1/16th scale test model on the way to taking full-sized thrusters to market. • One of the most innovative vendors we met was Michiel Vos, who founded CocoPallet five years ago. Vos came up with the idea of turning discarded coconut shells and coconut waste into products, including shipping pallets. 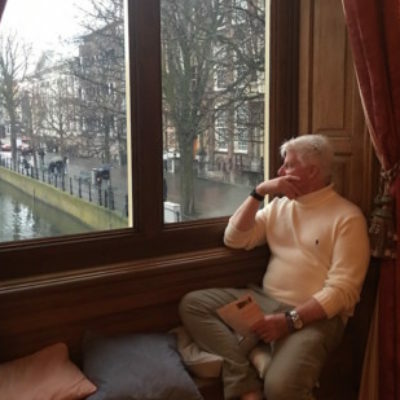 A former Dutch Special Forces soldier, Vos said he’s gone from no one believing in his idea to raising substantial capital and building a factory in Sumatra. The 100-percent natural and sustainable CocoPallet replaces wood pallets, “checking all the boxes” in social entrepreneurship from reducing logging to employing people in developing countries, he said. Easily the most passionate entrepreneur we met. • Dude, where’s my yacht? Vendor Georgios Koutras knows exactly where your yacht is via his Openlchnos geo-locating technology. Koutras, from Greece, told us he developed the technology in Greece for the yacht industry where owners typically rent out pleasure craft on “bareboat” charters. That is, no captain or crew and no supplies or fuel, just the boat. But seeing that dentist from Des Moines at the helm of your 1.5 million euro Franchini 76 might not be the most comforting sight. You might want to know where he went, where he’s going, where he’s been, where he is now and what he’s run into. Openlchnos makes a small, nearly undetectable self-powered black-box device that tracks all that data and more. Like Vaz, Koutras sees many uses for his device, including for the freight-shipping sector. The monitor sells for 300 to 500 euros, so that’s a pretty cheap insurance policy to make sure you get your boat back in good shape, whether it’s a container ship or a yacht. • Ionada. Another PortXL 2018 team, this Canadian scaleup uses a patented scrubber built on nanotechnology – hollow fibre porous membranes – to filter the sulfur oxide and nitrogen oxide from marine diesel engine exhaust. • Vendor Teqplay has impressive real-time logistics analytics. Their dashboards show everything from which ships are arriving at a port to where they’re departing and their ETAs. Yes, all this data makes for smoother port operations. But we saw soooo much more. Imagine that data collected and processed by, say, a Palantir and that could streamline commodity markets and trading patterns for everything from petroleum to pork bellies. Insight in the how, when, and where it is happening. Identify the opportunities. Understand the complexity of the logistical game on operational, tactical and strategic level. • THNK’s Annemarie Steen explored how entrepreneurs grow from failure. Steen led the crowd in an exercise where attendees, when they messed up the sequence of jumping, clapping and wiggling with someone they didn’t know, were encouraged to throw up their hands and say, “How fantastic!” It was silly (and fun) but was meant to show we all fail sometimes, and we have to learn from mistakes and move on. THNK is a school of creative management with locations in Portugal, the Netherlands and Canada. This was a large and well-run event with great refreshments, including the best coffee we’ve had in a while. The only negative was, just as the event ended, an alarm sounded and a Big Voice directed everyone to evacuate the building. Which is a shame because there were so many more entrepreneurs and teams we wanted to meet. It was that kind of event. We already have PortXL on our calendar for 2019. Post Scrip: Our guide, who’s also a mentor, said PortXL’s biggest need is partnerships with companies to test the products. So you might ping them call if you have a company. Mare Straetmans is managing director of PortXL. About PortXL: PortXL is the world’s first – and as far as we can tell – only port accelerator. PortXL partners with leading companies, organizations and innovators around the globe, from Singapore, Houston to Piraeus.